The scrapbook is incredibly important, but it requires you to put in some time to get as much benefit as possible! Essentially it’s a sticker album that you can randomly buy in the magic shop once you read level 10. Buy it and drag it from your inventory onto your character portrait to equip it. An icon will appear just to the left of the potions area. Mouse over it and you can see the text as well as information about your progress. As you see in the screenshot, when you collect more items, you get more XP! That’s amazing as it helps you gain levels more quickly. Click on the scrapbook and you go to the scrapbook itself. You can mouse over the tabs at the left to see your progress. If you see an item that’s bold, you have it! If it’s not so well defined then you don’t have it. 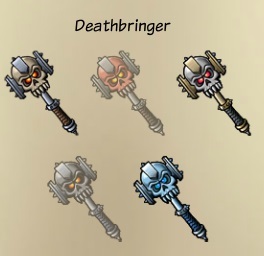 Looking at the picture below, I’ve only got three of the five Deathbringer warrior weapons. The difference is in the colour variations. The level of the item makes no difference, it’s simply based on the random colours. Note, however, that certain items are only available at certain levels. 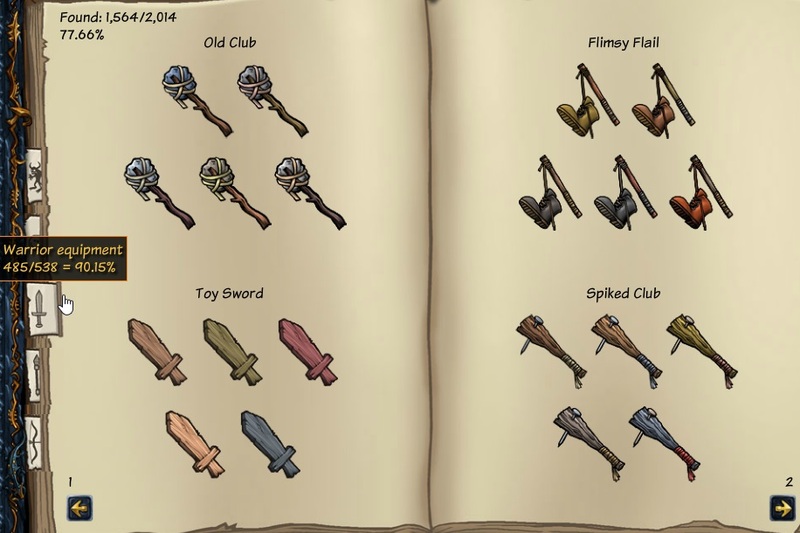 The deathbringer weapon is an example of this, as it wasn’t available when I spent a lot of time working on my scrapbook! There are several ways to gain new stickers. Complete dungeons, guild raids, etc and you’ll slowly fill this up. When you defeat a monster that you haven’t defeated before, that goes into your scrapbook. Don’t worry about trying to ‘collect’ these stickers as you’ll get them as you play the game. If you equip an item that’s not already in your scrapbook, it goes into your scrapbook. I wouldn’t suggest doing this actively, however. It’s far better to do the method below. This is the main way you can actively improve your scrapbook and I highly recommend doing this. The most casual way is to simply fight in the arena often. You’ll win some fights, and when you do, you’ll get a sticker for each of their equipped items that’s not already in your scrapbook. If you defeat someone who has four items that aren’t in your scrapbook, you get them all! Another option is to simply attack random lower level people who you’ll beat easily. They might have items that you can add to your scrapbook. Go to the hall of fame and randomly type in some numbers. If you’re rank 1000, maybe search for 12345, 98765, 5555, whatever. Fight and beat that person and you might be lucky! The more intense, and better, way to do things is to do it really … meticulously. As the name of the scrapbook suggests. Get them all and you get a lot more XP! Go through your scrapbook and look at one category first, say warrior weapons. Take screenshots of every type of warrior weapon which is incomplete and put them all onto one page. I use a combination of Microsoft Paint and Greenshot. Next, search the hall of fame for some people that you can beat easily. If you’re level 60, find people who are level 30. Check the weapons carried by every warrior until you find one with a weapon that you don’t have. Attack that person by clicking the crossed swords at the top right of their portrait. You gain no XP or gold and they lose none, but you gain a vital addition to your scrapbook! On your screenshots, make a note that you found that weapon. You could cross it off, highlight and delete the picture of the weapon, whatever you like. Just make sure it’s the right colour combination as it can be hard to tell the difference sometimes! Check the next warrior for other weapons that that you need and keep going. After a while, you’ll find all the weapons that you can find by attacking people of that level. Use the hall of fame to find of around level 10. Level 10 characters will have equipment that higher level characters won’t have, so it’s vital that you defeat low level people too! Once you attack people who are around half your level and around level 10, go on to attack those who are closer to your level. Make sure they’ll still easy to beat, meaning lower level and much lower hall of fame rank. I would guest you complete one category for one class and then do the same category in another class. For examples, do the warrior weapons first, then scout weapons and then mage weapons. Then go the warrior boots, scout boots, mage boots. The order isn’t important, but try to complete as much of one section as possible before you move onto the next. that will give you a sense of achievement and you’ll see how much of the scrapbook you complete and how much more XP you’ll be getting! Once you complete everything you can easily get to, you can forget about the scrapbook for a while. Remember that new equipment unlocks every so often, so do come back to the scrapbook every once in a while and see what you can work on next. Update 15/02/2017: I’m shutting down the comments on this page, as spam is added, but no legit posts.